A sci-fi horror flick written and directed by Leigh Whannell, who also co-wrote such hit horror movies as 'SAW' and 'INSIDIOUS' (and their first sequels). 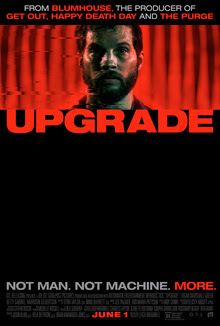 The film stars Logan Marshall-Green as a paralyzed man who uses an experimental computer chip to give him special powers and avenge his wife's murder. The film costars Betty Gabriel, Benedict Hardie and Harrison Gilbertson. It's received mostly positive reviews from critics, and it's also a modest hit at the Box Office as well. I loved it. Grey Trace (Marshall-Green) is involved in a car accident, with his wife Asha (Melanie Vallejo), and then the couple are viciously attacked by criminals. She's murdered in the incident, and he's paralyzed for life. Grey is then offered a chance to walk again, by having a computer chip embedded in his spinal cord. The operation is a success, but the computer chip also begins talking to him as well, and turning him into a super human fighting machine. With his new skills, Grey can also now avenge his wife's murder, but he quickly puts himself back in grave danger (in the process) too. Like his buddy James Wan, Whannell is really good at creating a nostalgic genre movie feel, similar to the B-movie hits of yesteryear. Marshall-Green is decent in the lead, and he actually goes beyond just doing a poor man's Tom Hardy imitation this time. The film is fun, disturbing, memorable, and it has a really good and dark twist at the end too. I'm sure genre movie fans will love it, and a sequel is inevitable.